Dhaani told him that Badi Amma and Dulaari came to meet her and got emotional. Viplav asked her to get ready. She came wearing black saree. Viplav said that she looked Gorgeous. She asked if she was looking bad. He told gorgeous meant shaandar. Dhaani asked him to come. 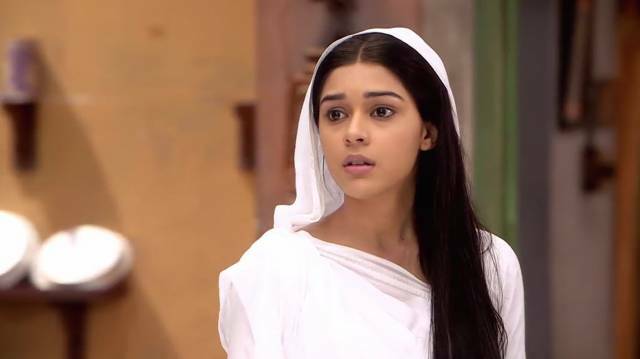 Viplav introduced Dhaani to Shekhar and his family and told her that he told them everything about Shalu and they had no issues. Shekhar said that he was lucky to marry his sister. Both came back home. Viplav hit plate to call everyone. All came and asked what happened. Viplav said that he selected a guy for Shalu, Shekhar. Dhashrath asked if he was Pandit Murari’s son. Viplav said yes, and he didn’t tell Shalu before meeting him. Dhashrath said that he knew their family and their family is nice. Shalu asked how he could fix his wedding without informing. He told her to see the guy and then decide. Dhaani came to Kanak, and she told Dhaani not to work anything as she would send Breakfast through servants. Dhaani thought not to feel bad as today is a happy day. Shekhar and his family came. Viplav said to call Dhaani. Dhaani came wearing saree and sindoor on her forehead. Everyone was shocked. She announced that she love Raja and have accepted him as the husband. Viplav asked about that nonsense. Shalu said that it was her decision and apologized to Shekhar and his family. He told Viplav that he should ask her sister and should not have called them. He said that he couldn’t marry her and asked her parents to come. Viplav apologized them. They left. Dhashrath requested to stop it as that family was not like this, nobody respected elders. Kanak said that this would happen when others take the decisions. Viplav went to Shalu and asked about the drama. Shalu said that it was not drama. He slapped her. Shalu stated that his love is love, and her love is not love. Viplav said that he was her brother and told that Raja was a cheap man. Shalu stated that he was innocent and haven’t touched Dhani. She stated that she would forget him if he would Forget Dhaani. Viplav was shocked and went to Dhaani. He told that Shalu is misunderstanding and is stubborn to get Raja. Dhani said to give her time and to make her understand with love, not anger and said that everything would be okay.